From Oh! Trendy™ A pair of Eiffel Tower candle holders with a classic silver finish. Each is of slightly different height, adding trendy asymmetry to both modern and classic décor, and their textures are designed to replicate the real-world tower's girder construction. These beautiful Eiffel tower candle holders are the perfect modern home décor candle holder set to add a modern, yet chic style to any room. The Eiffel tower candle holders are made of a polyresin material that helps to prevent scratching and breakage. This along with the modern, vintage style candle holder for fireplace ensures that your Eiffel tower candle holders will be enjoyed by you and your guests alike, for many years to come! Don't wait, buy your decorative Eiffel tower candle holders home décor now! 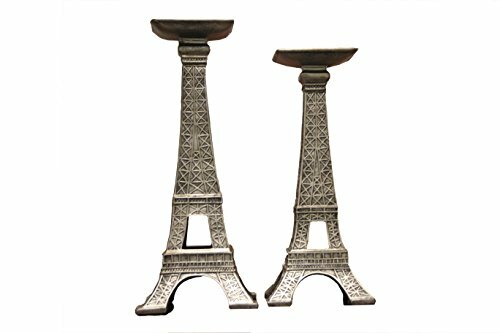 HOME/OFFICE DÉCOR: Use the Eiffel tower candle holders as a centerpiece of your table, or anywhere in your home as a modern decorative Eiffel tower home décor piece. This Eiffel tower candle holder set is unique enough to catch your eye and be the focal point of the room, yet subtle enough to be the perfect décor accent in any home. BEAUTY: The beautiful, clean lines of the Eiffel tower candle holder set décor piece show the detail and attention to craftmanship that goes into every artful Eiffel tower candle holder and home décor piece that we make. SILVER FINISH: This modern French inspired Eiffel tower candle holder home and office décor piece add a classic and modern, yet contemporary touch to any modern office or home décor. QUALITY MATERIALS: Our Eiffel tower candle holders are constructed from high quality polyresin materials. This material ensures the Eiffel tower candle holder home décor pieces - at 5.8 lbs total - can stand firm wherever you place them. If you have any questions about this product by Oh! Trendy, contact us by completing and submitting the form below. If you are looking for a specif part number, please include it with your message.